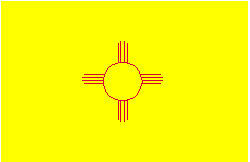 The yellow field and red symbol are the colors of Spain, first brought to New Mexico by Spanish Explorers in 1540. We see a red sun with rays extending from it. There are four groups of rays, four rays per group. This is an ancient Native American sun symbol called Zia. Their State Song is "O, Fair New Mexico", and you're listening to it. The State Flower of New Mexico is the large bloom of the Yucca. The Pinon, only tree named for a bird (Pinon Jay), and the largest wild orchid tree in the world, was chosen as New Mexico's State Tree. 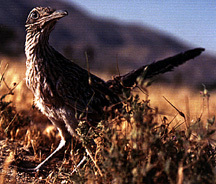 Many of you will recognize this comical little fellow - the Roadrunner. He has the honor of being New Mexico's State Bird. New Mexico shares its borders with Arizona, Colorado, Oklahoma, Texas and Utah. The State Motto is "It Grows As It Goes." The State Capital is Santa Fe, located in north central New Mexico. Are we all ready to climb in the Chevy and see this Land of Enchantment? OK, let's go. Click on the license plate, and we'll be on our way.